A rallying cry for working mothers everywhere that demolishes the “distracted, emotional, weak” stereotype and definitively shows that these professionals are more focused, decisive, and stronger than any other force. Working mothers aren’t a liability. They are assets you—and every manager and executive—want in your company, in your investment portfolio, and in your corner. There is copious academic research showing the benefits of working mothers on families and the benefits to companies who give women longer and more flexible parental leave. There are even findings that demonstrate women with multiple children actually perform better at work than those with none or one. Yet despite this concrete proof that working mothers are a lucrative asset, they still face the “Maternal Wall”—widespread unconscious bias about their abilities, contributions, and commitment. Nearly eighty percent of women are less likely to be hired if they have children—and are half as likely to be promoted. Mothers earn an average $11,000 less in salary and are held to higher punctuality and performance standards. Forty percent of Silicon Valley women said they felt the need to speak less about their family to be taken more seriously. Many have been told that having a second child would cost them a promotion. Fortunately, this prejudice is slowly giving way to new attitudes, thanks to more women starting their own businesses, and companies like Netflix, Facebook, Apple, and Google implementing more parent-friendly policies. But the most important barrier to change isn’t about men. Women must rethink the way they see themselves after giving birth. As entrepreneur Sarah Lacy makes clear in this cogent, persuasive analysis and clarion cry, the strongest, most lucrative, and most ambitious time of a woman’s career may easily be after she sees a plus sign on a pregnancy test. Sarah Lacy is the founder, CEO, and editor-in-chief of the investigative tech news site Pando.com. She has been covering technology news and entrepreneurship for over fifteen years, with stints at BusinessWeek and TechCrunch before founding her own company while on maternity leave in 2011. She lives in San Francisco. Most importantly of all, she is the mother of two young children. It would be far too easy to gush over this book, to say that it should be required reading for every woman who works outside the home, or has a daughter who does. It would be ridiculously simple to refer to the author, Sarah Lacy as one of the most important feminist voices of the modern era. Those things would be easy and simple because they are both true. This book is witty, yes, but it’s also wise. It’s a gift from one woman to many others, of the author’s experience and insight, and while it’s written in an upbeat tone, it’s also quite frank. More specifically, this book provides real advice on women in the workplace, especially after they become mothers. 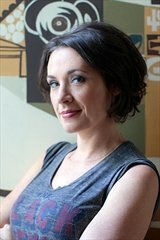 It talks about how to balance career goals with parenthood goals, but it also encourages women to be firm about how they’re treated, and sheds light on the way women in general, and women with children specifically, are perceived, and how to both cope and counter the (mostly) white, male establishment. I’m not a mother, and I’ve been out of corporate America for over a decade, but I still found this book incredibly informative, insightful, and even empowering, and I’m recommending it to all of my friends – women and men – who still work for other people. Will this book really help to overthrow the patriarchy? Maybe, maybe not. But it will open your eyes to what women face in the workplace every day, and, as the saying goes, knowledge is power. Goes well with grilled salmon, roasted red potatoes, a lush salad, and a glass of wine. 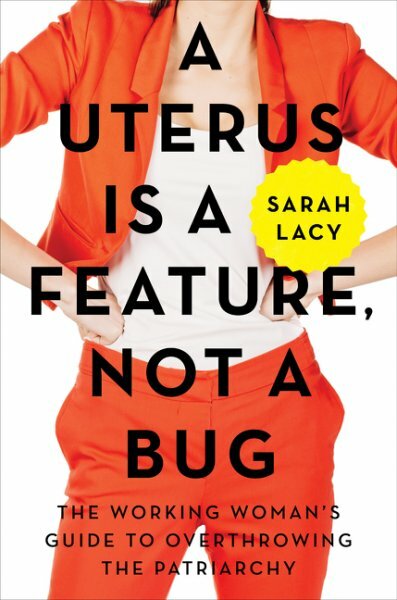 Review: A Uterus is a Feature, Not a Bug, by Sarah Lacy by Melissa Bartell is licensed under a Creative Commons Attribution-NonCommercial-ShareAlike 4.0 International License. I’d probably recommend it to every woman I know as well :) Enjoyed your review.